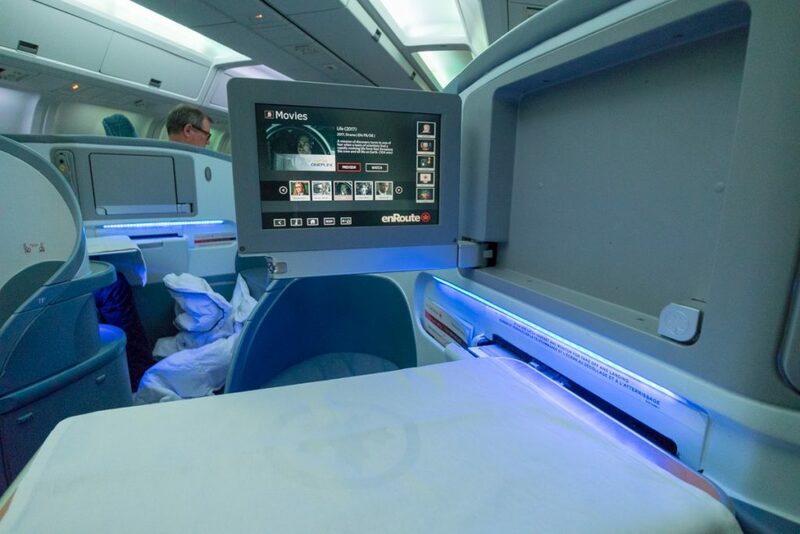 This review is part of a round-the-world holiday which kicked off on Air Canada between Sydney and Vancouver, followed by five nights at the Westin Whistler and two nights at the Sheraton Vancouver. My partner and I then flew onwards to Toronto. 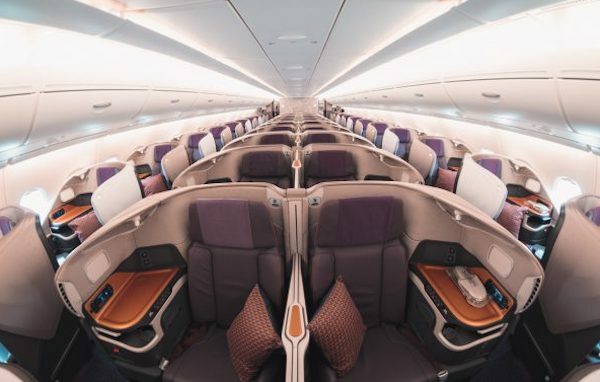 Longer, transcontinental flights across the US in Business Class are good value through Singapore Airlines KrisFlyer program – I used 20,000 KrisFlyer miles plus $50 in taxes per person. 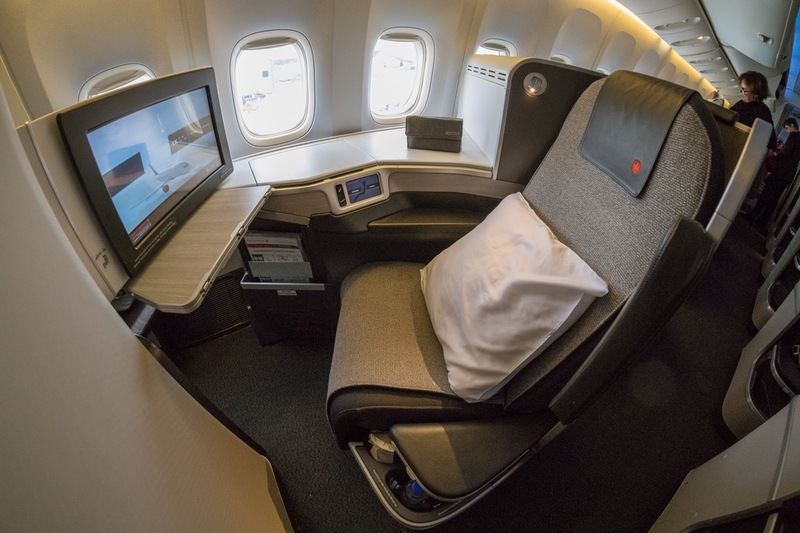 Air Canada currently uses a mix of aircraft on the Vancouver-Toronto route including Boeing 777 with international-grade reverse herringbone business class, Boeing 767 with herringbone layout and Airbus A321 with recliner business class seats. 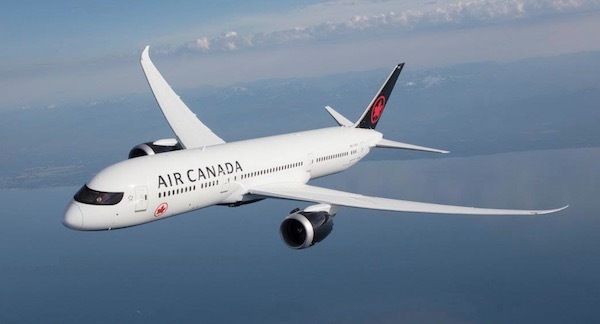 Air Canada are retiring the Boeing 767 aircraft and there are only seven left in the fleet so be sure to check the aircraft type before booking. 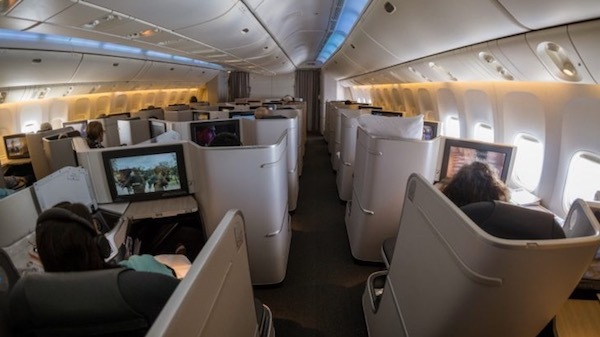 The business class cabin is configured with 24 seats in a single-cabin 1-1-1 herringbone layout where the A-seats face the aisle and the middle F-seats and the window K-seats face the other aisle (and each other). The best seats would be those in A which face the back of the F-seats however due to the last-minute change of flights the only window seat option I had was 7K. It is best to avoid the middle F-seats or window K-seats. 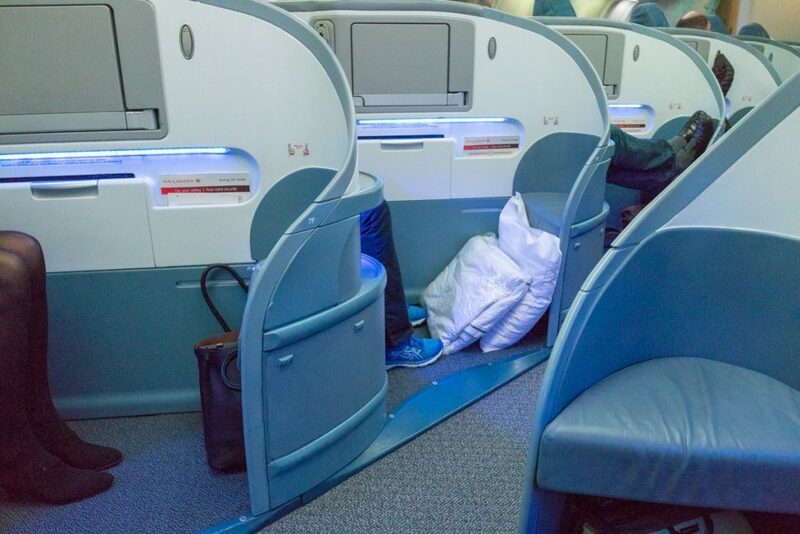 Compared to the new Executive Pod, the herringbone seats are very narrow, there is limited storage around the seat and zero privacy. 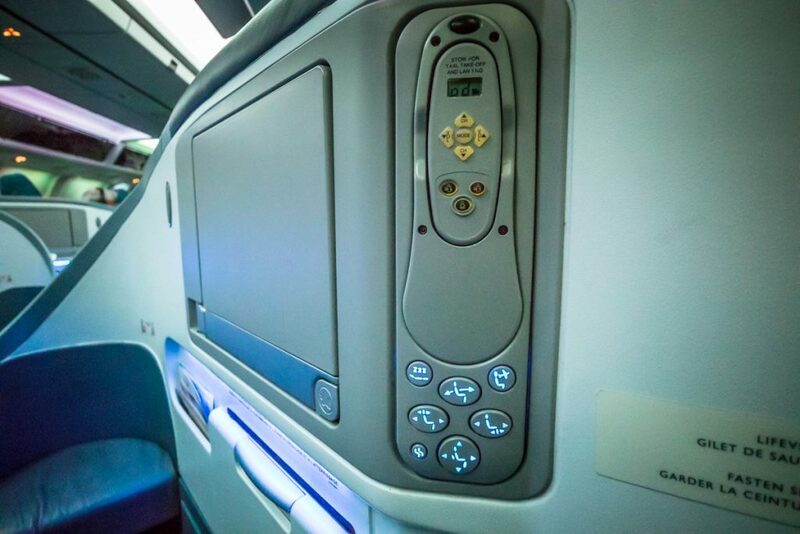 From seat 7K I could lock eyes with up to 10 passengers whilst eating, watching TV or working. 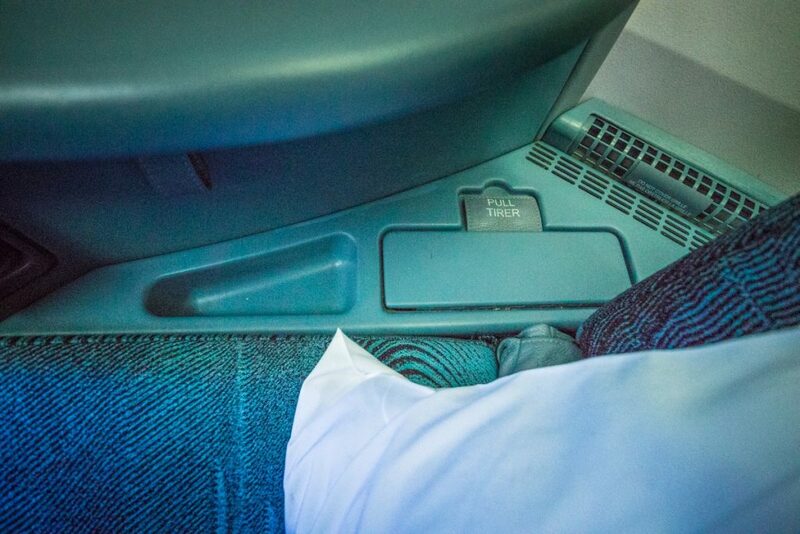 There is a small space under the footrest which is only big enough to store your shoes or a small bag. 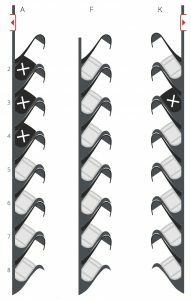 There is a small cut-out next to the seat, in front of the life jacket compartment, which is too small to store anything. 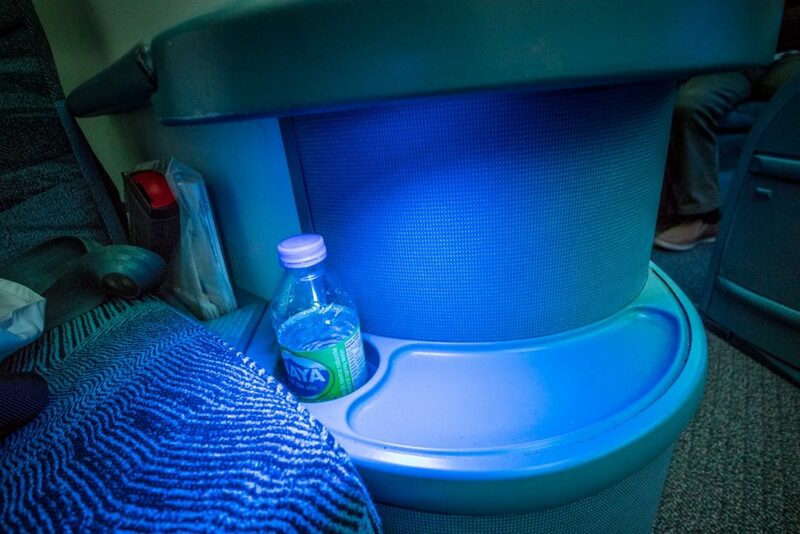 On the other side, there is a literature pocket, water bottle and a shelf. Signage clearly instructs you not to store anything on the air vents that are located directly behind your seat. 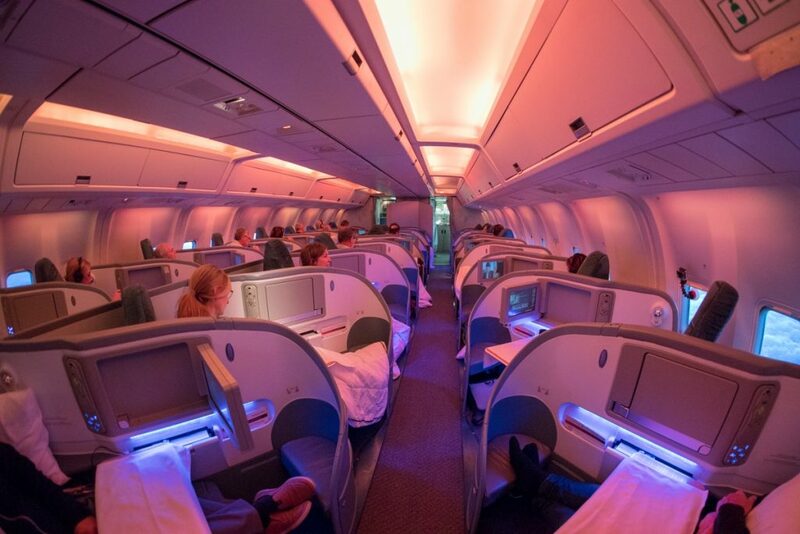 Looking at the rest of the cabin it seemed everyone just had to store bags and the supplied pillow and duvet at their feet. 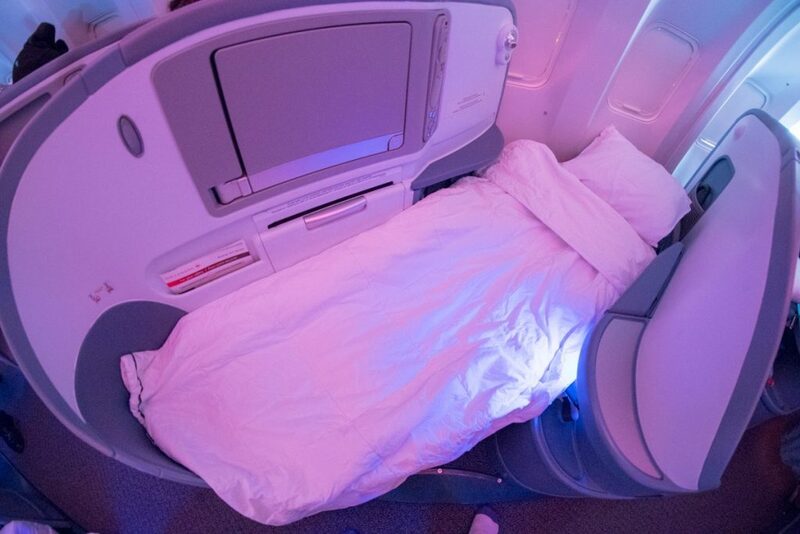 The seat converts to a flatbed and even when you are laying down there are still passengers sitting across from who you can look straight in at you as you sleep. After the breakfast service, I managed to get over an hour sleep. 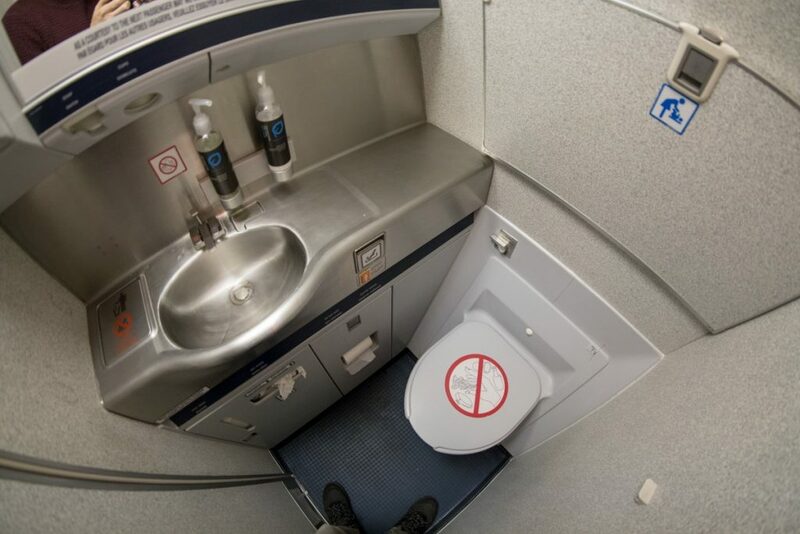 There are two lavatories at the front of the cabin. The aircraft, C-FOCA, was showing her age and was no surprise considering she was over 27 years old. 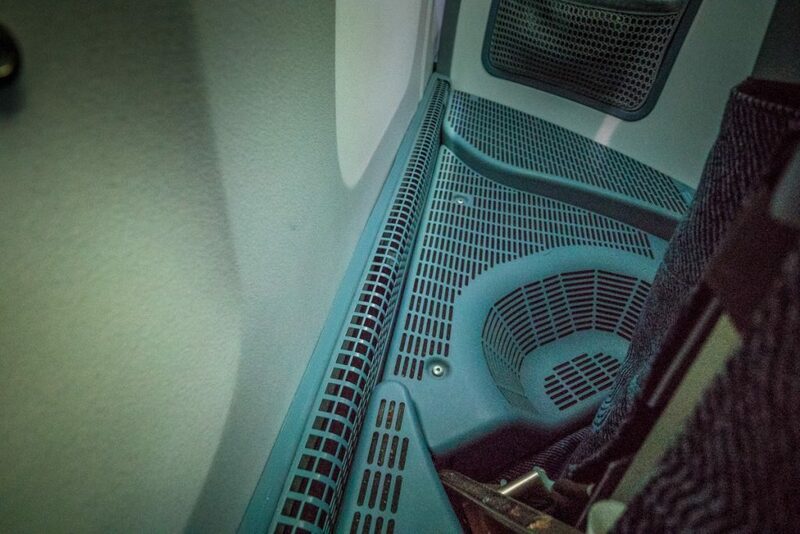 On take-off, my overhead compartment popped open but thankfully nothing fell out during ascent. A single-page menu is handed out before take-off. Breakfast started with an enormous plate of fruit with yoghurt and a choice of either an omelette or pancakes. 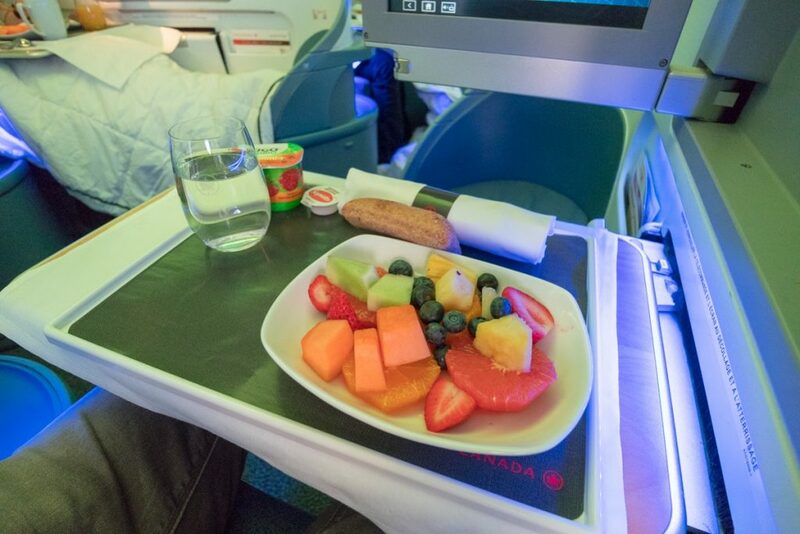 Air Canada also allows you to ’Dine Anytime’ (like on Qatar Airways) but this must be arranged with the crew prior to take-off. Roch, the CSM, and Brigette provided a friendly service. Rather than working separate isles, they worked as a team to deliver the meal service starting in the left aisle. This meant it took over an hour and a half to get to the rear of the right aisle. 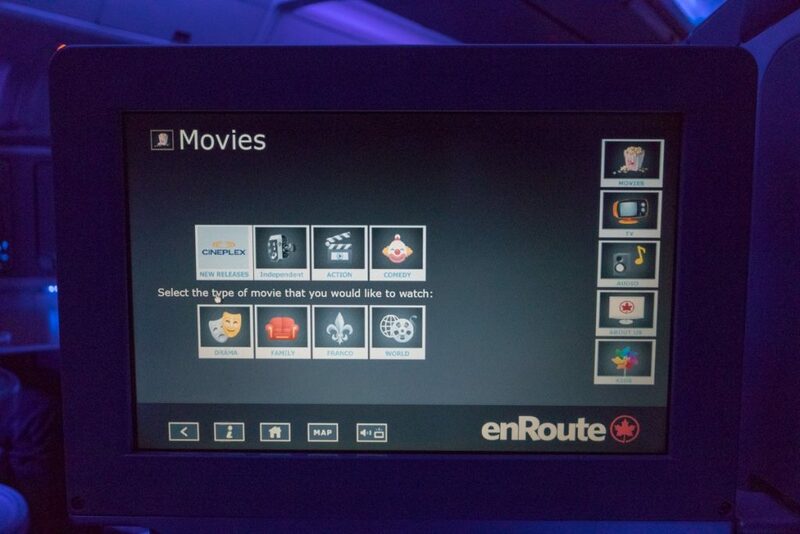 The IFE system has on-demand content, however, it was slow and unresponsive. 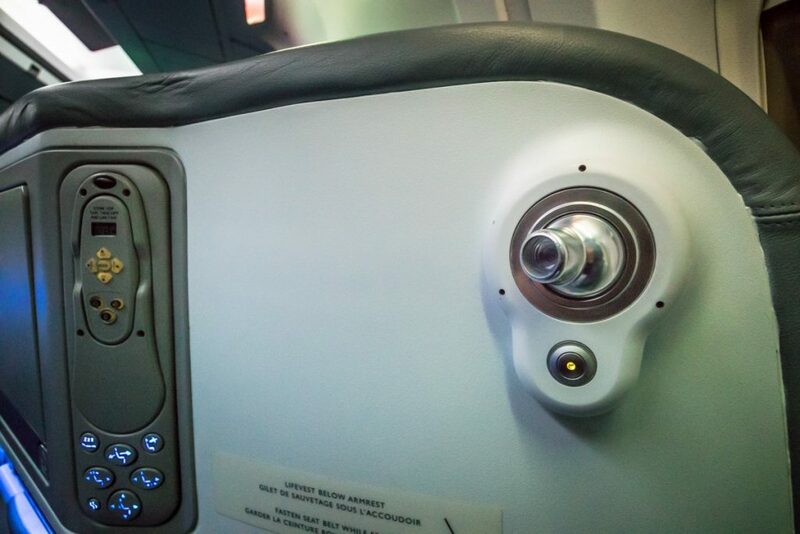 It locked up once during the flight and automatically restarted after a few minutes. 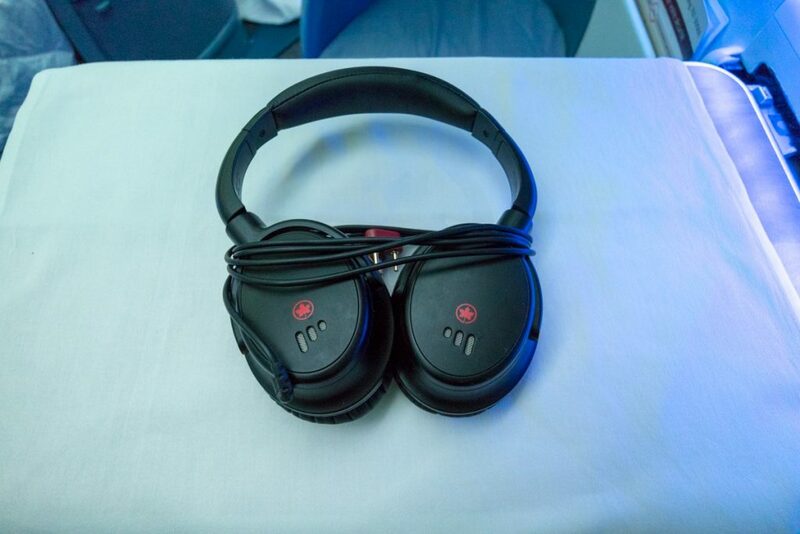 Noise cancelling headphones are supplied. 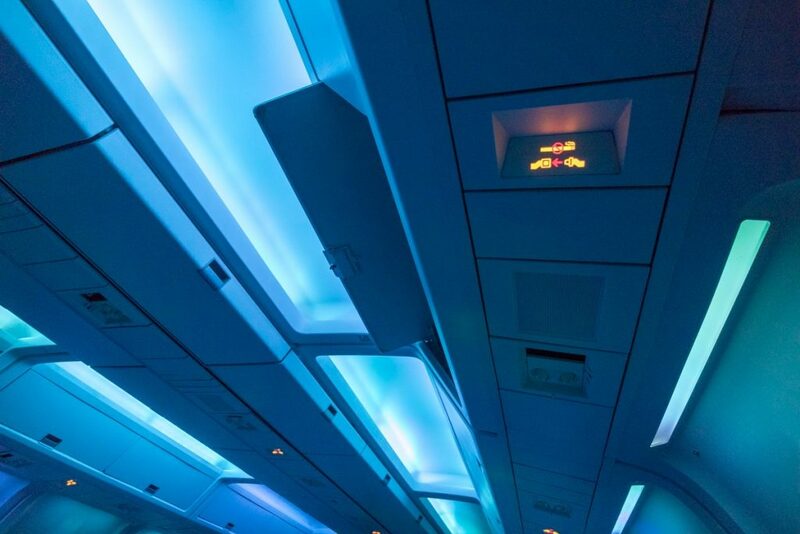 The IFE remote and seat controls are on the side wall including an adjustable reading light – mine didn’t adjust and just illuminated the opposite side wall. 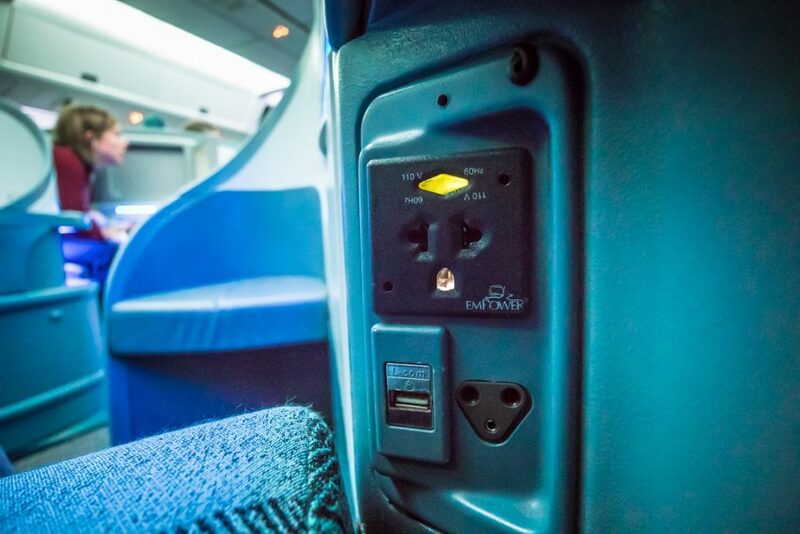 A power adapter and USB socket are located next to the headphone jack. 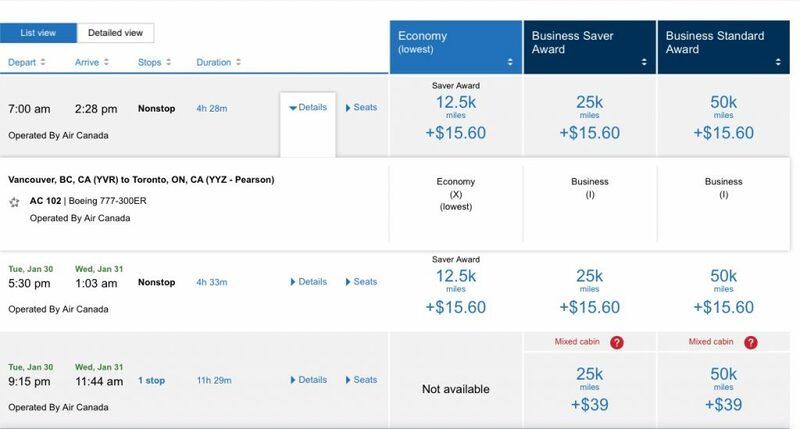 I researched the flight options on the United Airlines website as its calendar view shows business class availability at a glance. 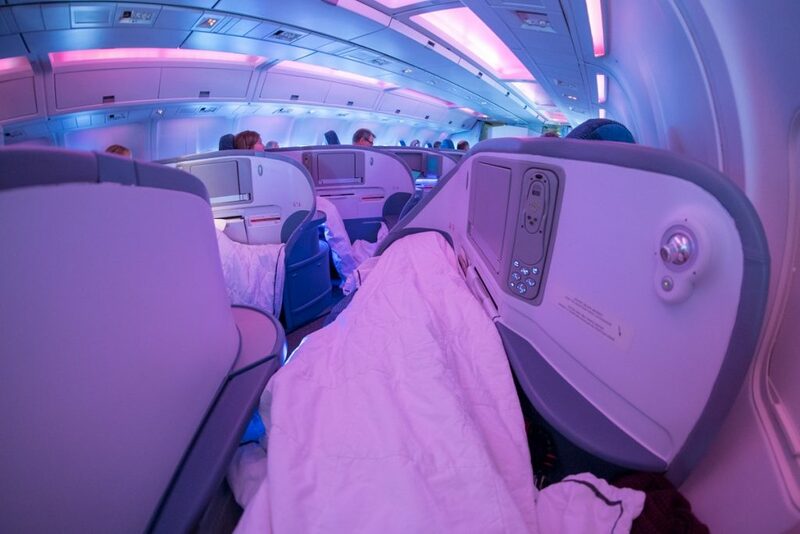 The one-way four-hour flight was valued at over AUD $1,200 at the time of booking and I could have used either 25,000 United miles and $15.60 in taxes or 20,000 KrisFlyer miles and SGD $52.10 in taxes per person (approximately AUD $50). I decided on the KrisFlyer option which provided a redemption value of $0.06 per mile. 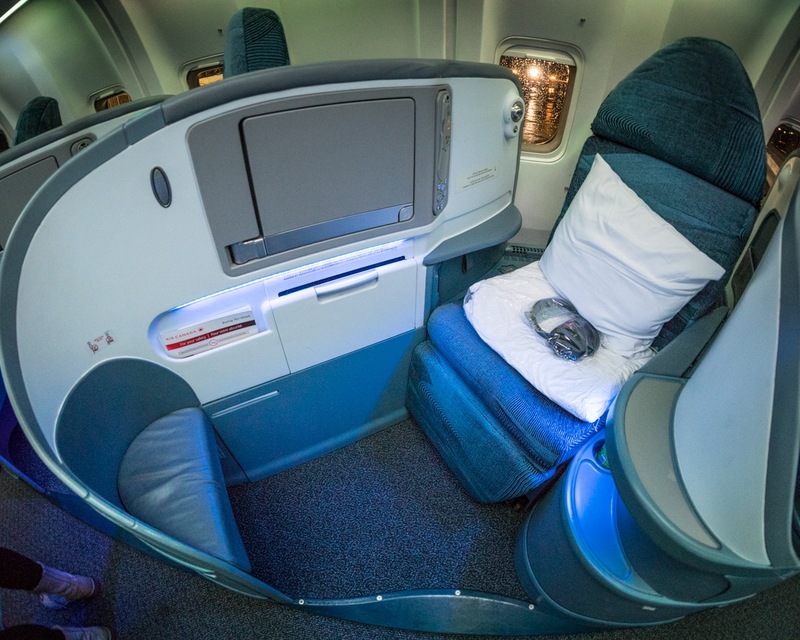 Based on my previous experience booking Air Canada flights, I made sure to call Singapore Airlines to confirm they could book these reward seats before locking-in plans. 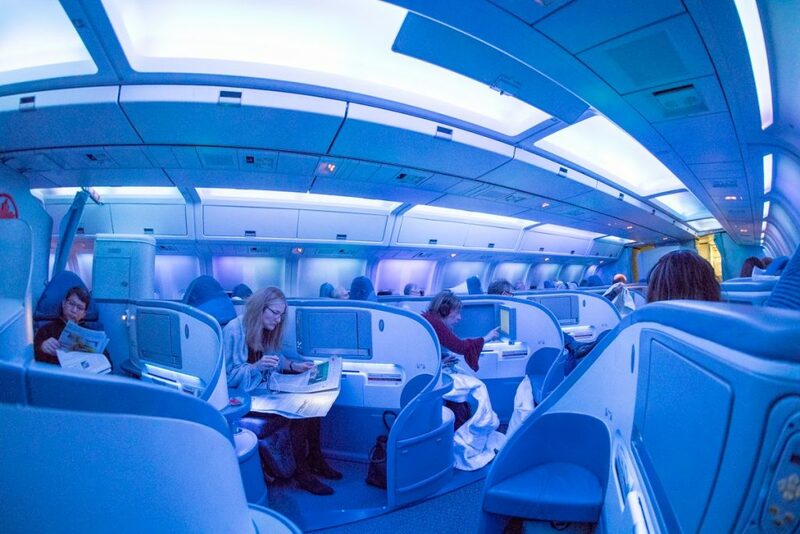 I originally booked AC102 primarily because it was on a Boeing 777 but unfortunately AC102 was cancelled three weeks before departure and we were bumped to the 6AM AC100 767 service. 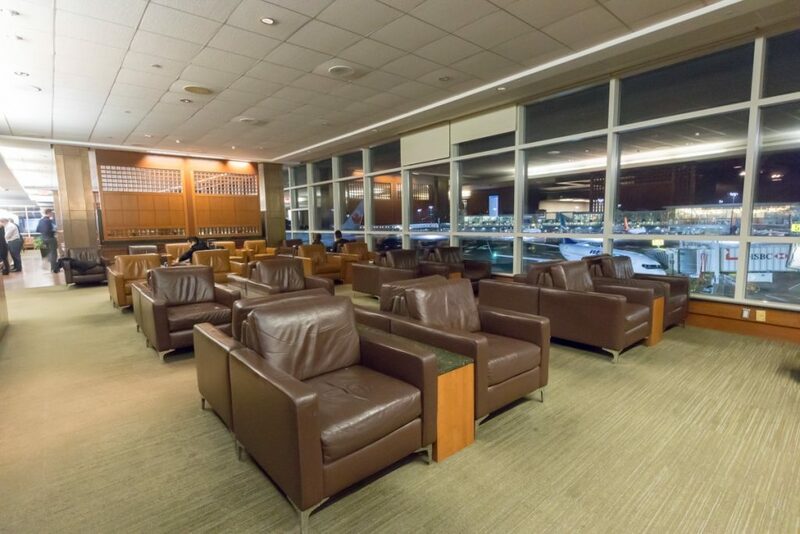 Although Aeroplan award seats were available on later 777 flights, these were not made available to KrisFlyer and after numerous calls to both KrisFlyer and Air Canada I had no option but to accept the earlier flight on the old Boeing 767.
Business class passengers can use the Air Canada Maple Leaf Lounge in Vancouver. 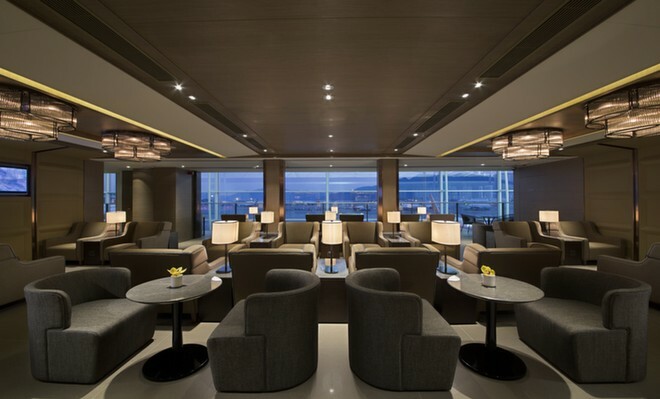 Those with Priority Pass access may want to compare it to the Plaza Premium Lounge, just keep in mind that the latter’s reviews mention a dated decor and crowded atmosphere. 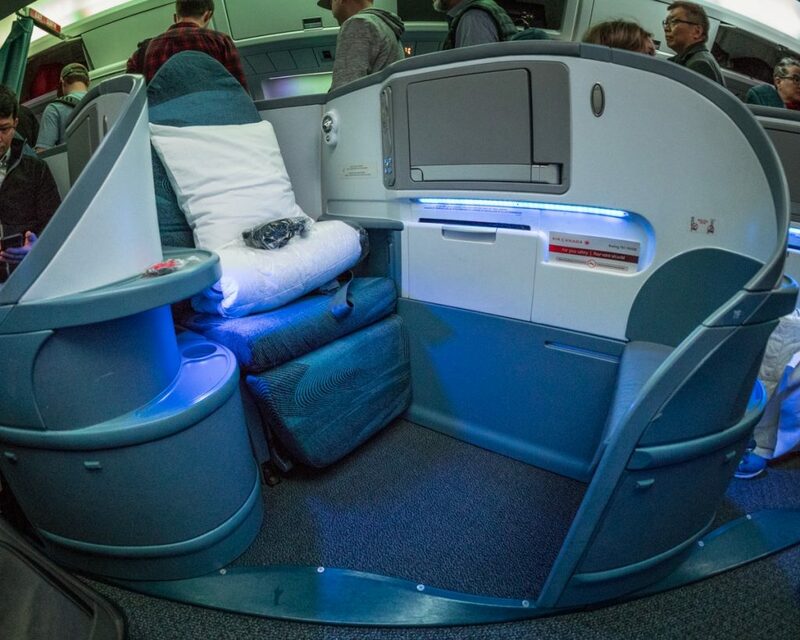 The herringbone seat configuration was groundbreaking at launch, however, it is not competitive in 2018 as it offers zero privacy or storage unlike the excellent Air Canada Boeing 777 I flew the week earlier from Sydney. 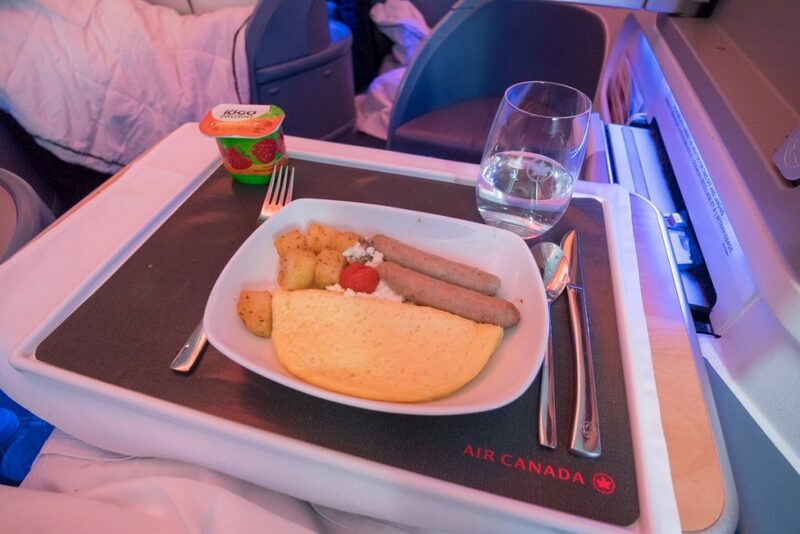 Though considering I received a great breakfast, friendly service, slept for an hour in a flatbed and arrived 20mins ahead of schedule – all for 20,000 KrisFlyer miles and $50 in taxes – I really can’t complain.